Andy H: It may have fallen a little bit behind schedule but my love for Ragnarok is undiminished. 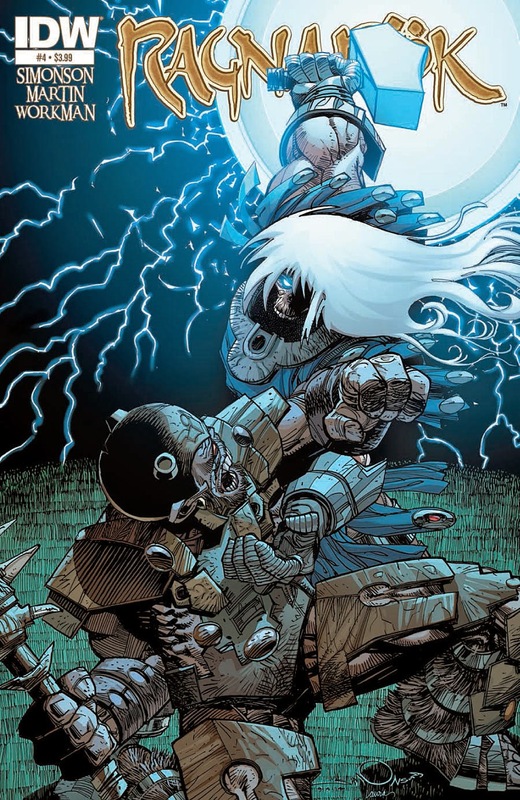 After the sheer volume of work Walt Simonson did on Marvel's Thor it's great to see him cut loose with his own, unique version of the Thunder God. Each page has been a joy to behold as the newly resurrected Thor comes to terms with the world after Ragnarok. This is a labour of love and it shines through. On the subject of Thor, issue #6 is out this week and the identity of the new (female) Thor is still unknown. The Odinson, like the rest of us, has been trying to work it out and now he's got a list of possible 'suspects'. With so much action in the last five issues the question of identity hasn't felt drawn out and I've really enjoyed the series. 'Spider-Verse' has finished so it's time to see what Dan Slott has got in store for Peter Parker in Amazing Spider-Man #16. I'd like to think he'll take it easy on Spidey for a bit... but I doubt it. This issue we also see the return of Humberto Ramos on art duties. Yay! Hard to believe that Mouse Guard will be 10 years old this year, so it's great to see the third volume of Legends Of The Guard hit the shelves this week. The idea is to get different writers and artists to tell untold stories of the Mouse Guard, nicely sandwiched between David Peterson's beautifully drawn bar scenes. Always a great read for all ages. Finally for me is Nova Annual #1. A while back, during AXIS, Nova went toe to toe with the Hulk and got a severe beating. Ouch. The Nova Corps helmet his father left him was badly damaged leaving his ability to access Nova's powers seriously sketchy to say the least. Now he's turned to the Hulk, sorry, Doc Green, for help and the two are off in space looking for the nearest galactic repair shop. Nova has been a fairly consistent read with a very likeable character. Round that off with Alan Moore's latest Nemo book, Southern Cross #1 and Postal #2 that's plenty of diverse and cool reading to look forward to. Stewart R: Yet another very last minute wobble and preview hunt has me picking up two Image #1s this week rather than my initially planned one. Ales Kot's The Surface #1 had been the guaranteed selection for the list with his particular brand of intelligent, politically-knowledgeable science fiction always worth a look. I'll admit that it's still just a touch unclear what this is fully about, but it's my solid gamble for the week for sure. Certainly clarity is what my second #1 for the week has in its sights as Southern Cross puts a mystery front and centre as Alex Braith goes about the search for answers into her sisters death way out on Titan, at a mining colony on the Saturnian moon. I did dismiss this title upon my first perusal of the week's delivery, but something about the three preview pages has caught my attention and I've the itch to see where that story leads. Elsewhere I will - having spent a little time in Testing, Testing looking at the first two chapters - be picking up Ant-Man #3, while both Matt Hawkins Postal and Jason Latour's Spider-Gwen get second bites of the cherry. Finally, I'll just mention that while I really don't like the thought of reading through any more of Brian Michael Bendis' X-Men work, I simply cannot stop myself from buying anything that the brilliant Mike Del Mundo has had a hand in and so I will have, HAVE to pick up All-New X-Men #37 just to see his illustrated wonders within that issue's pages.